Legion is a 2010 supernatural thriller starring Paul Bettany as the archangel Michael, who comes down to earth to fight for humanity's survival. The film's cast included Dennis Quaid, Adrianne Palicki, and Tyrese Gibson. 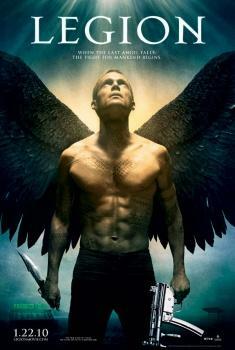 The story would be continued in the 2014 SyFy channel series Dominion. Michael (Paul Bettany) finds a weapons cache filled with assault rifles including several M16A2 rifles. Most of the weapons in the racks, however, are the inexpensive spring-powered M16A2 toy rifles, as indicated by the screw holes in the receiver and the M4-style step down in the full length A2 heavy barrel. Michael can also be seen on some occasions using an M16A2 with an M203 grenade launcher, although he more frequently uses an M16A4 in the same configuration. Michael finds a weapons cache filled with M16A2s among other rifles. Michael pulls two M16A2's with M203 Grenade Launchers. Michael with an M16A2 and M203 grenade launcher. Even angels know to keep the finger off the trigger. For most of the movie, Michael's weapon-of-choice is an M16A4 assault rifle fitted with an M203 grenade launcher. Due to a continuity error, his M16A4 occasionally becomes an M16A2 in some scenes. Michael fires his M16A4/M203 and MP5K. Michael picks up his M16A4 before going out to rescue Audrey Anderson (Willa Holland). If you look closely, it's possible to see in this image that the carry handle is removable, thus identifying the weapon as an A4. Michael fires his M16A4 at Gabriel. Heckler & Koch G36K assault rifles are also grabbed by Michael from the cache, appearing to be fitted with G36C-style rail tops. They are never used or seen again for the rest of the film. These are clearly the airsoft replica versions of the G36 as you can see the ejection ports are cast in plastic and the rounds in the mag are stacked side by side as opposed to staggered. Michael pulls two G36Ks from the rack. 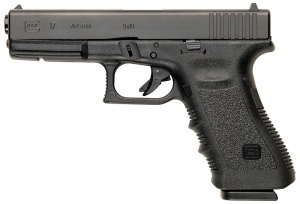 The Glock 17 is wielded by several characters and LAPD officers in the film. 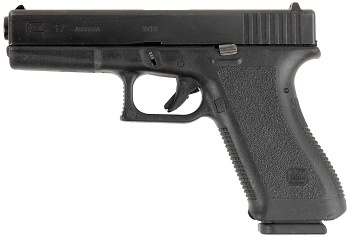 Nearly all of the Glock 17s in the movie are 2nd Generation models, although a newer 3rd Generation model is briefly visible in the scene where Michael is reloading all of his weaponry after the first assault by the zombies. Michael (Paul Bettany) holds a LAPD officer's own Glock on him. Bob Hanson (Dennis Quaid) professes his beliefs (or lack thereof) while holding the Glock. Charlie (Adrianne Palicki) holds a Glock. Note the trigger discipline. Michael points a Glock at a possessed little boy. An arsenal of weapons on a table in the kitchen as Michael reloads. Visible on the right is the only 3rd Generation Glock 17 that appears in the entire movie (all others are 2nd Generation models). Bob Hanson (Dennis Quaid) wields an Ithaca 37 with a sawed-off stock when the possessed woman attacks in the diner. Hanson fires his Ithaca 37 at the possessed woman. The Ithaca 37 on the floor before Jeep picks it up. Jeep (Lucas Black) aims the Ithaca 37 at the possessed old lady but can't bring himself to shoot her. Hanson holds his Ithaca 37 on Michael as Kyle Williams (Tyrese Gibson) looks on. Michael points the Ithaca 37 back at Hanson. The Ithaca takes out one of the possessed. The Heckler & Koch MP5K is wielded by Michael along with an M16A2 throughout most of the film. Bob Hanson (Dennis Quaid) also uses one in an attempt to stop Gabriel. 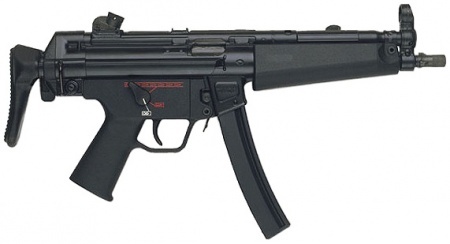 All of the MP5Ks in the movie have extended barrels, though only a few have the PDW folding stock. Michael fires a Heckler & Koch MP5K in his left hand as he fires an M16A4/M203 in his right. Michael with a Heckler & Koch MP5K in his left hand and an M16A4/M203 in his right. Bob before firing a Heckler & Koch MP5K at Gabriel. Michael fires a Heckler & Koch MP5K at Gabriel. Two Heckler & Koch MP5A3's with Navy trigger group are handed out to Kyle Williams (Tyrese Gibson) and Percy Walker (Charles S. Dutton). It's most common firearm in the film. Michael hands an MP5A3 to Kyle Williams (Tyrese Gibson). 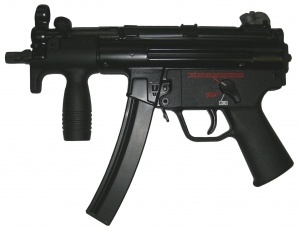 Michael hands an MP5A3 to Percy Walker (Charles S. Dutton). Michael gives a Heckler & Koch MP5K-PDW to Jeep Hanson (Lucas Black) and he uses it through most of the film. Michael hands an MP5K-PDW to Jeep. Jeep at the ready with an MP5K-PDW. Jeep fire the MP5K-PDW at the possessed little boy. Note how the flashlight has changed to a slimmer one. Throughout the movie, Michael (Paul Bettany) uses an M16A4 fitted with an M203 grenade launcher. He can also be seen using M16A2s with M203s. Michael with his M16A2 and M203 grenade launcher. Even angels know to keep the finger off the trigger. Replica M203 mounted on G&P M16A4 airsoft rifle. Michael fires his M16A4 with M203 grenade launcher. 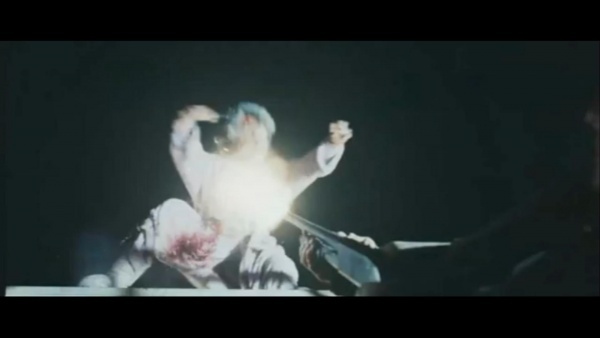 An M136 AT4 is used by Michael to take out a car driven by one of the possessed. Michael gets ready to fire the AT4. A stainless Para-Ordnance Nite-Tac is carried by Kyle (Tyrese Gibson) but is later given to Audrey (Willa Holland) while on lookout on the roof. Para-Ordnance Nite-Tac stainless steel - .45 ACP. Kyle's Para-Ordnance Nite-Tac barrel still smoking after shooting the possessed old lady several times. Kyle draws his Para-Ordnance Nite-Tac after Michael gets the Ithaca 37 from Hanson. Audrey with the Para-Ordnance Nite-Tac while on lookout. 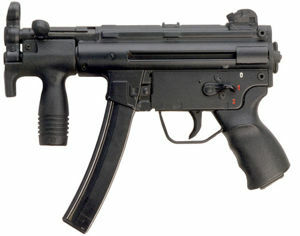 In the promotional poster for the movie, Michael wields a Heckler & Koch SP89 with an MP5K foregrip, but no such weapon appears anywhere in the film.